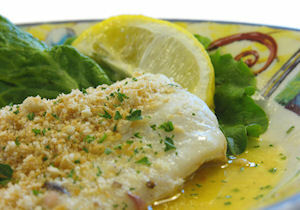 Crab is mixed with sautéed vegetables and cheese, and then haddock fillets are stuffed with the mixture. Serve it with plain pasta and buttered new potatoes for a special dinner. Finely slice the celery and the spring onions. Remove the skin from the tomato, along with the seeds, and finely chop it. Mince the garlic clove. Roughly chop the bread. Juice the lemon. Heat a little olive oil in a frying pan and add the celery, spring onions and garlic. Cook them for around ten minutes or until softened and golden. Add the crab, bread, lemon juice, tomato, cheese, egg, and season well. Remove the mixture from the heat. Preheat the oven to 200C and grease a baking dish. Place the haddock fillets on the baking tray and brush them with melted butter. Spoon the mixture onto one half of each fillet, then fold the fillet in half and secure it with a cocktail stick. Sprinkle any remaining crab mixture over the fish and then sprinkle any remaining butter over the top. Cook the haddock for twenty minutes or until the fish is flaking.